Wooden panels and doors slide and large facade windows are the main concept across the geometric remodeling of this narrow Barcelona apartment. 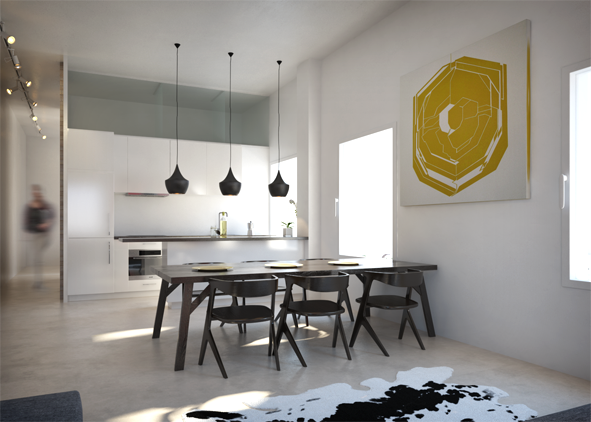 We redesigned the interior of the apartment to create a flexible living space for a couple. The apartment is situated at the beach front in Barcelona, "barrio de la Barceloneta" calls, for simple and refined solution. The reconfigured flat comprises an open-plan living area/kitchen, an en-suite master bedroom and one office space or further bedroom/guestroom. "The architects removed the original internal walls, replacing them with a long sliding wooden panel that conforms the rooms dividing the sleeping areas of the household from the living space". The project is named The Panorama Flat after this intervention.